One Friday night, on the way out of George Harrison’s Friar Park estate, I was sitting in my car waiting for the back gate to open. It was 11pm but I was in no particular hurry. Wow! This is going to blow Dad’s mind! I smiled. The afternoon had bloomed into a wonderfully glorious evening—the antithesis of my previous, first, much shorter visit. What a disaster that had been. I could laugh about that now. I freaked out. I realized I didn’t have the slightest idea what topic George was talking about, and now his lips were moving, in my direction, though I couldn’t detect any sound coming from them. My vision was ok, however, I could still see, and what I was looking at was George pausing in his conversation for me to reply. With my mouth gaped open, mummified tongue glued to the roof, I willed myself to speak and choked on a brief series of snorts and grunts that were so obviously unrelated, so remarkably inarticulate, and so comically unintelligible, I expected George, Olivia, his wife, and Dhani, his son, to laugh out loud. Surprisingly, they kept straight faces. George got bored rather quickly and politely excused himself. Watching him leave caused my body to enter a form of hypovolemic shock. While Olivia assisted me down, past the stone gargoyles smirking on the stairs, I panicked and snorted intermittent noises that were intended to be apologies—the best I could do in order to try and salvage this colossal disaster. “I promise,” she said, smiling, closing the door. I knew she was just being kind. There would never be a next time. Not after a performance like that. Incredibly, there came calling a next time! Olivia, indeed, knew what she was talking about. I was relatively composed during this second visit. It had been wonderful too. Better than I could have expected. The gate had yet to make any movement in its long wide swing to open and usher me out of Crackerbox Palace. I really didn’t care. I was perfectly content, waiting in the dark, basking in the evening’s great victory. 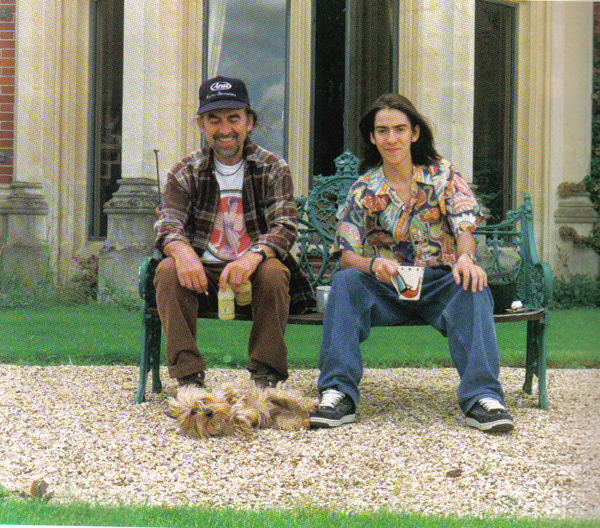 One special moment, I smiled when I thought of it, about two hours into the visit, when George had already had his fill of technology for the day and had escaped through a tapestry curtain on the far side of the room, son Dhani, opened a file on the Mac that displayed an image of the Magical Mystery Tour album cover. I got as far as, “I remember …” and Dhani quickly clicked and closed the file—no comment. I got the feeling he was testing my reaction to see if I was one of those Beatle freaks. It didn’t take him long to find out. Dhani opened another file of a photo of his art student friends that he had twirled, pontillized, craquelured, and Photoshop only knows what else. It was a striking image. He wanted to print it on the new Tektronix dye sublimation printer I had set up earlier. What he had yet to learn, however, is that what you can render on a monitor is not necessarily what you get when the print hits the paper. Monitors and printers exist in two distinctly different image rendering spaces. And from what I could tell looking at his extraordinary image, it was likely too complex to be rendered true by the new Tektronix, or any other printer I was acquainted with for that matter. I couldn’t believe it! It was a perfect representation of Dhani’s artwork! Naturally, I shared in the glory. Well, come on, I recommended the Tektronix, didn’t I?—over the advice of another, more local, Apple distributor I might add—whose representative btw had argued that the Tektronix I was recommending was way overkill and six times the cost of the color printer that he was flogging—insinuating, from what I surmised, that I was taking the Harrisons for a ticket to ride. 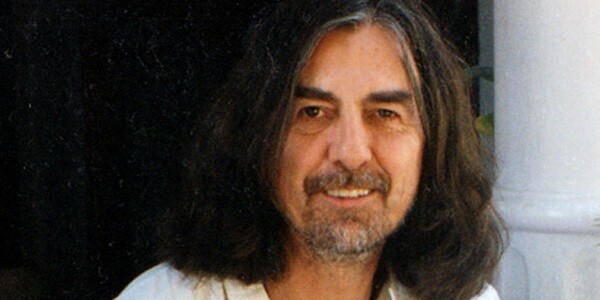 Watching Dhani hold his artwork high above his head, both of us in victory formation, then him dashing through the mystical curtain to show it to George, was singularly the most satisfying moment in my career of schlepping computers and software across two continents. Wow! This is going to blow Dad’s mind! Indeed. What I did not know, however, was that very soon, within the hour, the absolute, hands-down, unimaginable, worst moment of my working life was sure to follow. Part two of this story continues at Went To A Garden Party. Good Ice Laden Morning Wayne… Looking forward to Sat. edition…. You’ve got my attention for sure. Can’t wait for more. Those are good albums for sure. #1 Sgt Pepper’s Clear winner there. 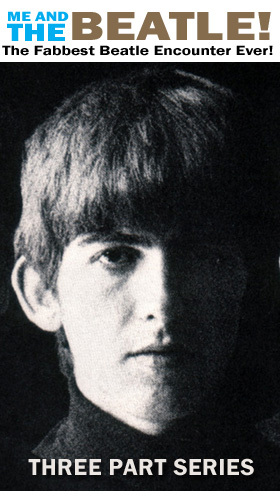 George was already my fave but that sitar sound on Pepper’s blew me away. I put my guitar away for awhile after Pepper’s. I just figured there was no way I could ever replicate that sound. Never forget when that album came out. In fact, on its release, the man who posted the reply above you, Jeff Day, who was our drummer, was spending the weekend at my house when Mom bought my sister and me the Pepper’s album. I don’t remember Jeff’s reaction to Pepper’s but i listened in awe. Honorable mention: My first Beatle album. Mom picked up a copy of Please Please Me in the PX at Fort Jackson. Because Ft. Jackson was a US military base, it sometimes offered records from Europe. I didn’t know anyone who had PPM. Everyone had Meet The Beatles.